Robert F. Batt served with the 368th Engineers in Europe during WWII, including some time in coal mines. At 18 years old, Robert F. Batt enlisted in the family business of hanging wallpaper and painting with his dad, Eugene, throughout the Tonawandas. Perhaps that’s how Uncle Sam learned of Robert’s work ethic and explains why he received a draft notice in May 1943 at 27 years of age, married and the father of a baby girl. Batt’s skills, which included carpentry, landed him in the Army Engineers, where he was taught how to disarm mines and other unexploded ordnances. “I did quite a bit of construction and destruction in Europe,” the 98-year-old Amherst resident mused. What he vividly recalls is his arrival at Normandy’s Utah Beach about a week after D-Day on June 6, 1944. Ever so carefully, Batt explained, he and his fellow engineers would disarm the devices and place them in a heap for detonation. Another job was the construction of a gasoline pipeline from Omaha Beach to the front lines. And while the engineers were not routinely tasked with engaging the enemy, as the infantry was, they certainly took their share of enemy fire and, at times, doubled as infantry. 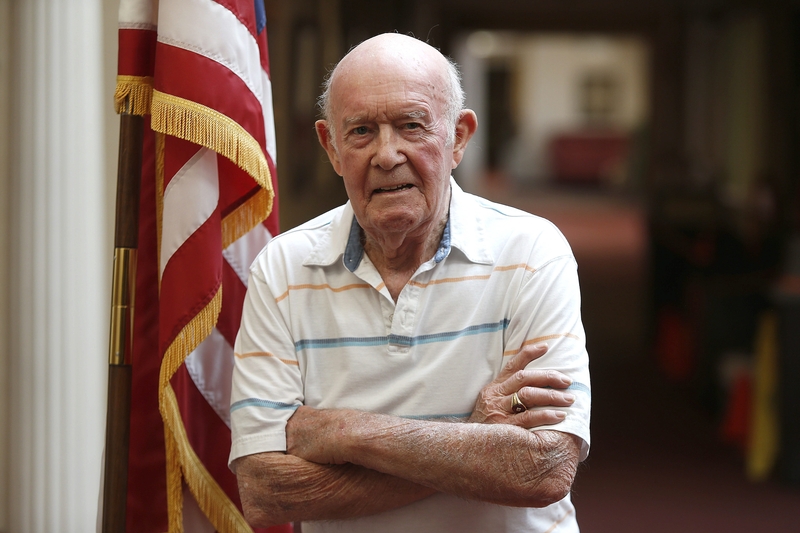 “During the Battle of the Bulge, we backed up the infantry because there were such heavy losses. We were there in case we were needed. We mostly came under artillery fire. It was scary and noisy, too,” he said. As the war progressed into Germany, Batt said, his unit went underground – literally. “We were assigned to the coal mines just over the border from Belgium. At one of the mines, we had to splice back together a cable for the elevator. The Germans had intentionally cut it. We went down into the mine, myself and a corporal. We were looking for contraband,” he said. And wouldn’t you know it, they hit pay dirt. Topside, the food was put to good use. Batt also had some other disturbing yet memorable encounters, but not with civilians. Instead, the big guy himself, Old Blood and Guts, officially known as Gen. George S. Patton, head of the 3rd Army. “He yelled at me back in England when we were working at headquarters. He said we weren’t doing a good job building Quonset huts. I was in charge of the detail. I said, ‘Yes, sir,’ and, ‘No, sir.’ He said, ‘If this job isn’t done by tonight, I’ll have your stripes.’ We finished the job that night. “I met him a few days later, and he said, ‘You’re doing a good job, and that’s what I like to see.’ Then when we were putting up a flagpole at headquarters, I was at the top of the pole painting it, and Gen. Patton’s dog was grabbing onto the rope that was dangling from my bosun’s chair. After the war, Batt felt supreme relief to at last be back home painting and wallpapering as a civilian. The family business had come to a halt in 1944, when his father passed away from a massive heart attack. In 1981, Batt says, he and his wife, the former Dolores Behm of North Tonawanda’s Gratwick section, retired to the South after raising two daughters and a son. Last year, after 32 years in the Florida sunshine, they returned and took up residence at Amberleigh, a retirement community in Amherst. While he misses Florida’s warmer weather, Batt says he is proud that he and his wife hold the distinction of being married the longest of any their fellow residents, with a record 74 years of marital bliss. His memories of the war are not so blissful, he says, and are never far away.